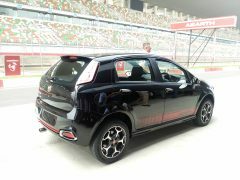 Fiat Punto Abarth and Avventura Abarth launched at INR 9.95 lacs! 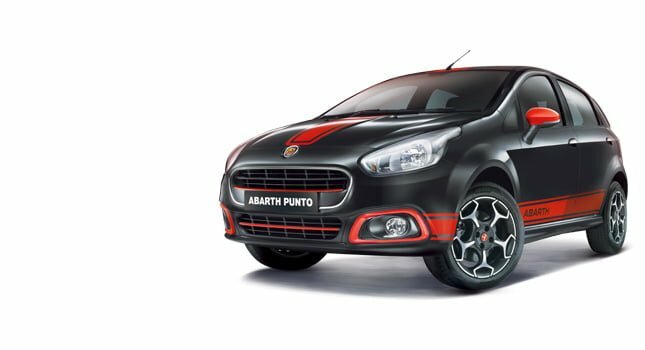 Fiat India has given its Punto hatchback and Avventura crossover a much needed dose of extra power with the launch of the famed Abarth versions for the two vehicles. The launch of the Punto Abarth and Avventura Abarth took place simultaneously. Up until the introduction of the Abarth versions, both the Punto and the Avventura didn’t have a powerful engine variant, with performance from the current set of motors being adequate at best. It may be noted that the Fiat Punto is currently sold with two power options for the petrol variant producing 67bhp and 89bhp while the Avventura gets the 89bhp engine. However, all this is bound to change with the advent of the Abarth variants. 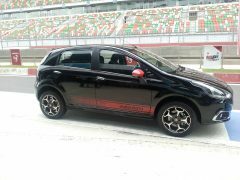 Here, in this post, we list down all the available details on the Fiat Punto Abarth and Avventura Abarth. Both cars come at an introductory price of just INR 9.95 lacs making them staggering value for money. While the design has been carried forward from the non-Abarth model, the upcoming Abarth variant gets some styling tweaks to make the car look sportier and more aggressive. The Fiat Punto Evo Abarth gets Abarth badges, a contrasting horizontal slat on the radiator grille, red painted ORVMs, Abarth decals and sportier-looking alloy wheels. The car also gets a discreet set of side skirts. On the inside, the car features an all-black color theme that gets red contrast stitching on the upholstery. The car also gets sports pedals. The Punto Abarth and Avventura Abarth are powered by a 1.4-litre T-Jet MultiAir 4-cylinder petrol engine that delivers 145 bhp and 212 Nm. The cars is capable of hitting a top speed of 195kmph and can dismiss 100 km/h from standstill in 8.8 seconds. The car can also cover 1000 metres in just 30.4 secs. The new Fiat Punto Abarth will have a fuel economy of 16.3 km/l. Internationally, this 143bhp 1.4 litre motor powers the regular Punto while the Abarth version gets the same engine with power bumped up to 153bhp. There is also an ‘esseesse’ variant with a power output of 177bhp. 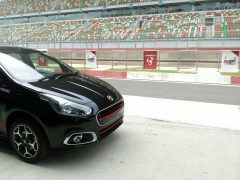 Here in India, the 143bhp version will be sold under the ‘Abarth’ moniker. The “Fiat Avventura Powered by Abarth” gets the same power-plant, but the peak power-torque is slightly lower at 140 hp-210 Nm. The motor will come mated to a 6-speed manual gearbox and the Avventura Abarth can sprint from 0-100 km/h in 9.9 seconds. 1000 m from a standstill can be dismissed in 31.8 seconds.The car has an ARAI-certified fuel economy of 17.1 km/l. The Punto Evo and the Avventura are great cars with excellent built quality, road control, style, stability, safety features, etc with the only real problem being the lack of power. Fiat’s decision to launch the Punto Abarth and Avventura Abarth is a smart one and seems pretty logical as it addresses this issue. Also, it will give the company an edge over the rest as none of them have any hatches with power ratings as high as that of the Punto Abarth. 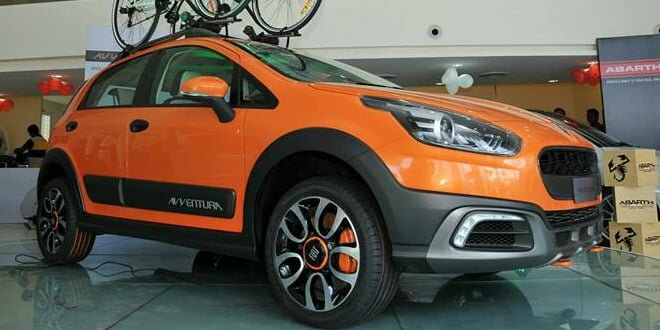 As for the Fiat Avventura the Abarth version with increased power will help it in fighting the higher powered version of the Renault Duster, Nissan Terrano and Ford EcoSport. Stay tuned to Car Blog India for more on the Fiat Punto India launch.